Tired of the embarrassment, poor speech and compromised biting and chewing resulting from tooth loss? Looking to end this compromise of your lifestyle and self-image? If so, Dr. H. David Allick and his team at White Flint Dental Associates eagerly desire to help. A true expert in the placement of dental implants at his Rockville practice, Dr. Allick takes smiles with missing teeth and returns them to full form and function. In other words, his patients can smile, laugh, eat, speak and even brush and floss very naturally with state-of-the-art dental prosthetics which reside right in the jaw bone. The American Academy of Implant Dentistry states that dental implants solve the issues caused by teeth lost to gum disease, trauma or decay. How can these oral health care providers claim this? The answer lies in dental science. Unlike conventional bridgework or partial/full dentures, dental implants attach directly to the patient's jaw bone. The screw-like implant device, made from titanium fuses to the jawbone through a process called osseointegration. Over the course of several weeks following implant placement surgery, osseointegration forms a rock-solid foundation for an extension post and realistic porcelain crown to be attached to the implant. Studies published in the Journal of Prosthetic Dentistry show that with good oral hygiene at home and at the dental office, the implant will last for decades--even a lifetime! Key to dental implant success is sufficient bone density. If your jaw bone is sizable enough and strong enough, you likely can receive dental implants. Dr. Allick carefully examines potential implant patients to be sure they have adequate bone and that their gums and overall health are good. Dr. Allick performs this simple oral surgery right at White Flint Dental Associates. He anesthetizes the area and places the implant in the jawbone under the gumline. After the site is closed with sutures, the patient goes home to heal. After several weeks or months, the patient comes back to White Flint Dental Associates for attachment of the post and crown. Multiple dental implants stabilize and support fixed bridgework (for one, two or more missing teeth in a row) or even partial or full dentures. This technology gives patients with substantial gaps or complete tooth loss the freedom of natural-looking teeth that act and feel like the real thing and that avoid the bone and gum recession that accompany tooth loss. Why not schedule an implant consultation with Dr. Allick? He'll determine if you and dental implants are a good match. Call today: (301) 881-6666. As in other parts of medicine, lasers are beginning to change the way we provide dental care. More and more dentists are using lasers to make earlier diagnoses of dental disease or provide surgical treatment. One area prime for change is the treatment of teeth with deep decay and in danger of being lost. For decades now, the best way to save teeth in this condition is with root canal treatment. In this common procedure we access the pulp, remove the infected tissue with specialized hand instruments, and then fill and seal the pulp chamber and root canals with a special filling. We can now potentially improve the efficiency and increase the success rate of this treatment with laser technology. With their focused light, lasers emit a concentrated burst of energy that's extremely precise. In many instances laser energy can remove the target diseased tissue without damaging nearby healthy tissue. In this form of root canal treatment, we use lasers to remove tissue and organic debris within the pulp and then shape the root canal walls to better receive the filling. We can also utilize the heat from laser energy to soften and mold the filling, so that it better conforms within the walls of the root canals. Using lasers in root canal treatments may require less local anesthesia than the traditional approach and also eliminates disturbing or discomforting sounds and vibrations. Dentists who've used the new technology also report less bleeding during the procedure and less pain and occurrences of infection afterwards. But there are a couple of disadvantages for using lasers in root canal treatment. For one, light travels in a straight line — and many root canal networks are anything but straight. More complex root canal networks may still require the traditional approach. Laser energy could also increase the tooth's inner temperature, which could potentially damage tissues even on the tooth's outer surfaces. Used in the right circumstances, though, lasers can be an effective means to treat diseased teeth. Â As laser technology continues to advance and becomes a mainstay in dental care, you may soon find it part of your next dental procedure. If you would like more information on root canal treatments, please contact us or schedule an appointment for a consultation. During his former career as a professional footballer (that's a soccer star to U.S. sports fans) David Beckham was known for his skill at “bending” a soccer ball. His ability to make the ball curve in mid-flight — to avoid a defender or score a goal — led scores of kids to try to “bend it like Beckham.” But just recently, while enjoying a vacation in Canada with his family, “Becks” tried snowboarding for the first time — and in the process, broke one of his front teeth. Some fans worried that the missing tooth could be a “red card” for Beckham's current modeling career… but fortunately, he headed straight to the dental office as soon as he arrived back in England. Exactly what kind of treatment is needed for a broken tooth? It all depends where the break is and how badly the tooth is damaged. For a minor crack or chip, cosmetic bonding may offer a quick and effective solution. In this procedure, a composite resin, in a color custom-made to match the tooth, is applied in liquid form and cured (hardened) with a special light. Several layers of bonding material can be applied to re-construct a larger area of missing tooth, and chips that have been saved can sometimes be reattached as well. When more tooth structure is missing, dental veneers may be the preferred restorative option. Veneers are wafer-thin shells that are bonded to the front surface of the teeth. They can not only correct small chips or cracks, but can also improve the color, spacing, and shape of your teeth. 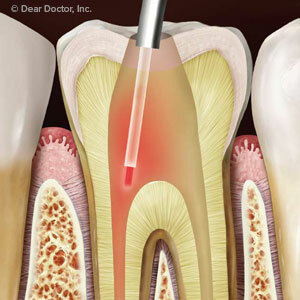 But if the damage exposes the soft inner pulp of the tooth, root canal treatment will be needed to save the tooth. In this procedure, the inflamed or infected pulp tissue is removed and the tooth sealed against re-infection; if a root canal is not done when needed, the tooth will have an increased risk for extraction in the future. Following a root canal, a tooth is often restored with a crown (cap), which can look good and function well for many years. Sometimes, a tooth may be knocked completely out of its socket; or, a severely damaged tooth may need to be extracted (removed). In either situation, the best option for restoration is a dental implant. Here, a tiny screw-like device made of titanium metal is inserted into the jaw bone in a minor surgical procedure. Over time, it fuses with the living bone to form a solid anchorage. A lifelike crown is attached, which provides aesthetic appeal and full function for the replacement tooth.